Ceramic braces are one of the most popular alternatives to traditional metal options. Shaded to match your teeth in color, ceramic braces are much less noticeable than silver alternatives. 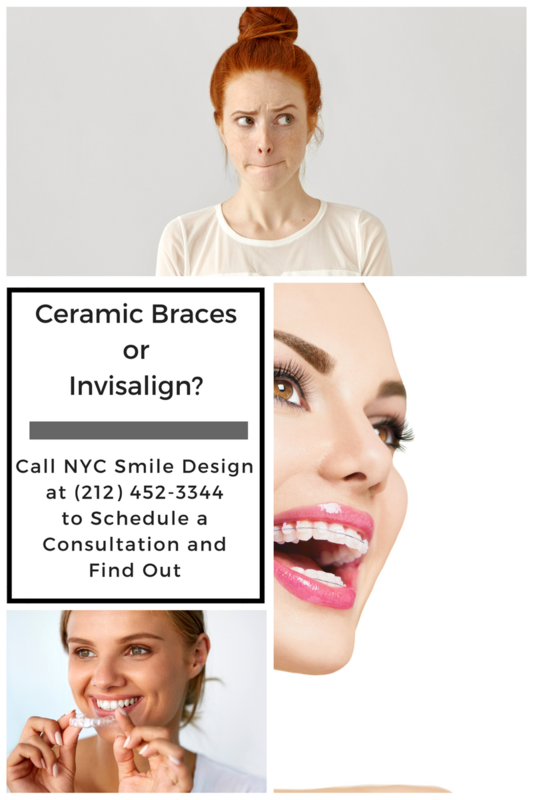 New York City dentists Dr. Elisa Mello and Dr. Ramin Tabib use clear arch-wire for ceramic braces as well, helping ensure they are as unobtrusive and unnoticeable as possible. If your teeth look dingy, yellowed, or stained, they can make you feel self-conscious, less confident, and unwilling to smile. Fortunately, these issues can easily be dealt with long before this year’s holiday parties. All they require is a call to NYC Smile Design to schedule a teeth whitening treatment. The placement of dental implants at our Manhattan office is virtually painless. Thanks to advancements in both implant technology and topical anesthetics, we are able to place dental implants without heavy sedation and, while some mild discomfort may linger for a day or two following implant placement, over-the-counter medications are typically enough to address the problem until it subsides on its own. Several studies have found that smiling increases happiness, reduces stress, and improves self-confidence. Sadly, many people hide their smiles out of embarrassment. The stars that shine in our nighttime sky – outside of the city at least – are primarily hydrogen and helium. Your smile, no matter how hard you try, will never be as bright. But our earthly stars – those who shine on screen and stage – have teeth just like yours and, just like just like you, must put effort into keeping those teeth bright, straight, and attractive. Surface stains are the main cause of tooth discoloration. By removing these stains, teeth naturally begin to look whiter, brighter, and more appealing. Depending on the type of staining you are dealing with, it may be possible to accomplish this without topical bleaches and other more involved teeth whitening options. Every moment of every day is filled with choices. What you choose plays the most direct role in what you experience. What you experience informs what you choose next. It can be a tough pill to swallow, but nearly all of this is entirely within your control. Of course, external factors have to be taken into account as well – but at the core, at the very root of your life experience, your choices have the biggest impact. This is both a tremendous responsibility and an opportunity for liberation. You get to choose how to work with it. Tooth discoloration is one of the most common reasons to seek cosmetic dentistry. We offer both in office at take home teeth whitening at our NYC office – and these options are fine for people with surface stains. But what happens if your staining is deeper or your discoloration is more pronounced? In these cases, our cosmetic dentists will likely recommend a more advanced option such as porcelain veneers.